Ornaments for sale at the Christkindlmarket Chicago in Daley Plaza. Ornaments for sale at the Christkindlmarket Chicago. 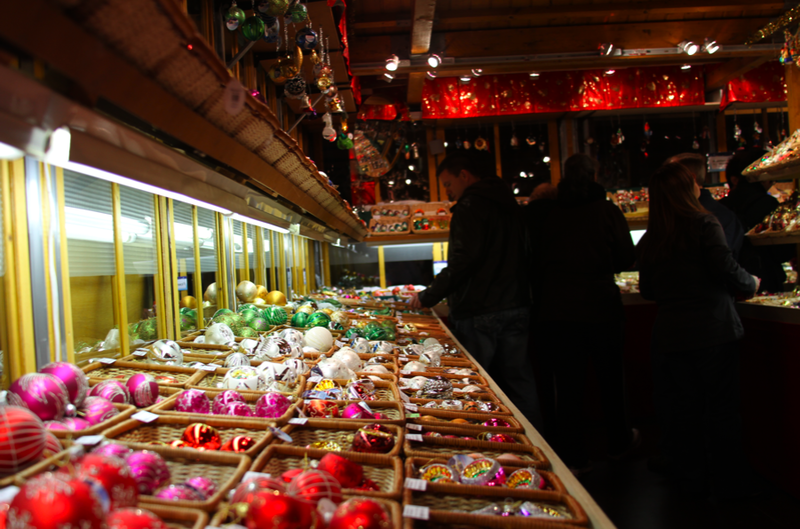 An ornament shop at Christkindlmarket Chicago. Rich Schmidt spends his weekends busy baking strudel inside a tiny stall with two others at the Christkindlmarket Chicago. The steady stream of customers means he has to keep baking most of the day to keep up with the orders for apple strudels, spinach puffs and pastries slathered with Nutella. The annual event transforms Daley Plaza in Chicago’s downtown into a European-style open street market. 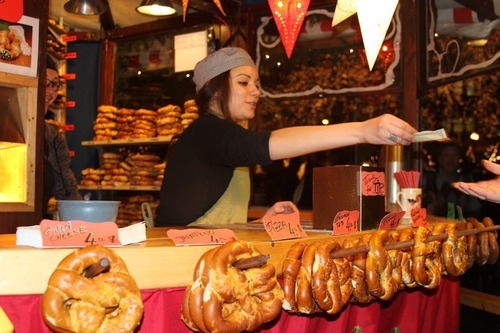 Food vendors are mixed with dozens of temporary shops that sell wooden toys, Christmas tree ornaments and festive mittens and knit caps. The open air market starts in late November and stays open until Christmas Eve. Rich said the Helmut&apos;s Strudel oven keeps the workers toasty even on the coldest days. “It’s just a great time," he said. "My heritage comes from Germany and Ireland, so it’s kind of nice. Some of the best days is when you’ve got some snowflakes coming down. It’s just such a warm atmosphere even when you’re walking around outside. I don’t even think you feel too cold, especially if you have a gluhwein in your hand." It’s time to order some lunch: I try some schnitzel and potato pancakes. I try to find a spot at the tables where people are cozied up with little souvenir boots of wine and steins of beer. Katherine Borg invites me to join her family&apos;s table. When Borg&apos;s brother and sister-in-law come from Kentucky to visit her in the Western Surburbs of Chicago, they always take an afternoon to visit the Christkindlmarket. "Spiced wine is good," her sister-in-law Linda Dillon laughs. And Borg said she doesn&apos;t have to drag her teenage son to the market. He&apos;s studying German in school and is always eager to come along. The food is delicious, but I’ll leave it to Louisa Chu to delve into the culinary options of the market in more detail. 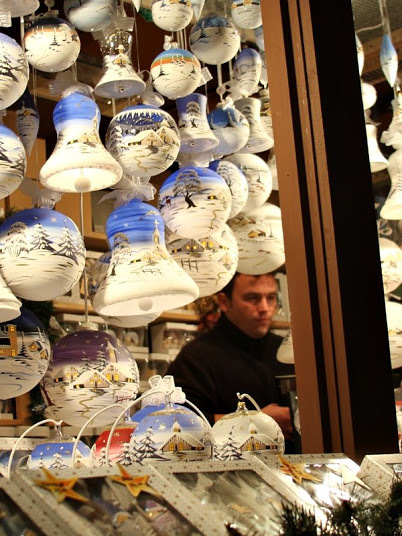 Chicago is home to a large German-American population; but the market also hosts visitors from all over the world looking for a taste of Europe for the holidays. I hear at least a half a dozen languages in the crowd. Rich said the diverse crowd is one of his favorite parts of working at the market. “It’s a blast just meeting everyone from around different worlds - Germany, Russia, Mexico, Ireland,” he said. At another stall, Franz Straub peers over his bifocals and engraves delicate glass ornaments. He spends most of the day carefully engraving names onto ornaments for customers while they wait. If there&apos;s a lull, he keeps busy carving new ornaments. "I engrave for example now, the eyes of the owl so we can see it better, much better," Franz said as he held up a bright bird figurine. He has worked at the Chicago market for twelve years and said he learned the trade back in Germany. Nearby, children crane their necks to look up at a massive Christmas tree — several stories tall — twinkling with multi-colored lights. They’re lined up to get inside Santa&apos;s house. It&apos;s a good deal for everyone. The kids get to give Santa the rundown on what they want for Christmas. The parents get a free photo of the visit. While they wait, they&apos;re entertained by a group of carolors huddled together and singing "Hark the Herald Angels Sing." As soon as I leave the cluster of little wooden houses and strudel shops that Christkindlmarket uses to give visitors a taste of Germany, I&apos;m greeted by Chicago again: a street musician in a Santa hat playing festive songs on his saxophone. The smooth sound follows me down the steps to the El train.